The Church of the United Brethren in Christ, USA, recognizes the validity of a collective Christian conscience. Throughout its history, the church has chosen to make specific statements as interpretations of our collective convictions on matters of membership, family, and social issues. These statements are found in chapters 4-6. 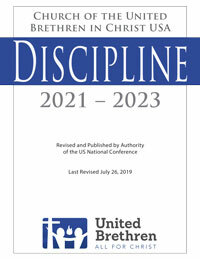 We believe the statements in those chapters are consistent with the Word of God and, thus, are to be observed by all members of the Church of the United Brethren in Christ, USA. Local churches shall seek to instruct, reconcile, and reform members whose lifestyles consistently conflict with these standards. When reasonable attempts at restoration fail, such members shall be removed from the membership roll. In areas not defined in chapters 4-6, the following statements will serve as a guideline for developing appropriate biblical convictions. The United Brethren church recognizes its responsibility to help members apply biblical commands and principles to contemporary issues. The Bible gives clear instruction on many issues, but on other issues, it leaves room for Christians of equal spiritual commitment and insight to disagree. The church’s historic position has been to stand firm on biblical absolutes, allow freedom where the Bible allows freedom, and maintain unity when disagreements arise. The Bible is the primary source of correct guidance and the final authority by which Christians should determine proper conduct regarding moral issues. The Bible’s specific prohibitions must always be obeyed. In areas where Scripture does not give explicit directions or absolutes, the following guidelines will assist members in making wise lifestyle decisions based on biblical principles. 1. Pray for guidance (James 1:5). 2. Study all biblical passages related to the issue. 3. Review the laws of the land regarding the issue (Romans 13:1-7). The Bible instructs believers to obey the laws of the land in which they live, but not to use those laws to justify disobeying biblical principles (Hebrews 13:17). 4. Seek the counsel of mature Christians (Proverbs 15:22, 27:17). 5. Carefully weigh and consider current scientific and medical evidence regarding the issue (Proverbs 18:15). 6. Consider any harmful effect your action may have on others. 7. Consider any harmful effect on your testimony (Romans 14, 1 Corinthians 10:32-33). 8. If in doubt, act according to your conscience and continue developing your convictions (Romans 14:23). The entire Discipline can be downloaded as a PDF file and printed on 8.5×11″ paper. The Discipline can also be read on the UB App.